Golden Bear Travel Corporation (GBTC) is the general sales agent of EL AL Israel Airlines, Israel’s flag carrier, and a wholesale vendor of selected travel products. It offers various tour packages to different holy sites and natural wonders of Israel, bridging the Philippines and Israel for tourism since 1991. With a special air link arrangement between Philippine Airlines (PAL) and EL AL Israel Airlines Ltd (El Al), traveling to the Holy Land has become easier for Filipino tourists and businesspeople. 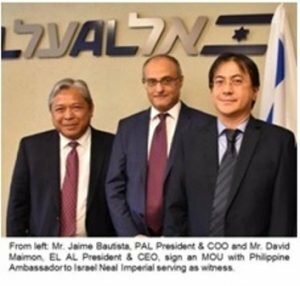 PAL President and COO Jaime Bautista and El Al President and CEO David Maimon signed a Memorandum of Understanding last year to stimulate the flow of tourists between the two nations. With GBTC, booking and arranging flights are more convenient. The air carrier deal allows Filipino tourists to depart the Philippines and arrive in Israel on the same day. PAL brings travelers to Hong Kong, where they transfer to a nonstop Boeing 777 flight to Tel Aviv’s Ben Gurion Airport. El Al Airlines flies to 180 destinations worldwide, offering more than one flight per day in some destinations. This gives tourists a broad spectrum of flight options wherever they will originate. Filipinos planning to visit Israel will find booking a flight convenient through the El Al Airlines/GBTC website. Tourists may buy tickets online with their tour. There are at least six tour packages designed to showcase Israel’s best places, depending on the traveler’s visit purpose. Securing a tourist visa is no longer necessary with the new travel relations between the governments of Israel and the Philippines. Tourists may check in online through this page, anytime from 24 to 3 hours before their flight. Still, they are encouraged to arrive at the airport check-in counter 2 hours (for Business, VIP and First Class passengers) or 3 hours (for Economy Class passengers) before departure. For more detailed information, El Al Airline’s Customer Care team handles all kinds of queries, including flight booking, rescheduling or cancellation; visa information and immigration services; airport lounges, transfers and facilities; in-flight entertainment and meals; missing luggage, delayed flights, and even duty-free allowance. The Golden Bear Travel Corporation office is at Unit 348 Mile Long Bldg, Amorsolo St. Legaspi Village, Makati City. For bookings interested clients ma contact their phone numbers at +63 2 816 1639; +63 2 816 2387; +63 956 2295742 or email: [email protected] or [email protected] They may also follow their account on Facebook, LinkedIn and Twitter.